President Trump has announced plans to pull the U.S. out of the Paris Climate Agreement — an outrageous, absurdly reckless move that abdicates U.S. climate and clean energy leadership, makes us a pariah on the international stage and threatens our children's future, all to bolster big polluter industry profits. Tell Trump and his administration that you are appalled by this reckless, short-sighted move. Urge them to put America — not polluters — first, and NOT pull out of the Paris Climate Agreement. Tell Trump and his administration NOT to follow through on their reckless plans to pull the U.S. out of the Paris Climate Agreement. Dear President Trump, Secretary Tillerson and Secretary Mattis, I am outraged that your administration is planning to withdraw the U.S. from the Paris Climate Agreement. This landmark agreement is the world's best hope to combat climate change. The U.S. joined nearly 200 countries that made historic commitments to reduce carbon pollution -- and as the second largest polluter in the world, the U.S.'s participation as a climate leader is essential. Pulling the U.S. out of the agreement is bad for our planet. It's bad for the security of our children. It's bad for our economy. It's bad for national security and our relations with nearly every other country on earth. In fact, the only winners would be the fossil fuel industry, who can pollute with impunity while we, the American people, pay the price. 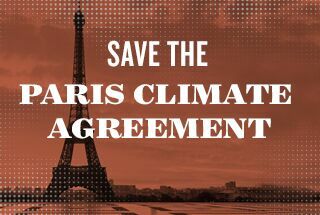 Please do NOT to pursue this reckless move, and consider alternatives to pulling the U.S. out of Paris -- for the sake of our climate, our national security and future generations. Thank you.